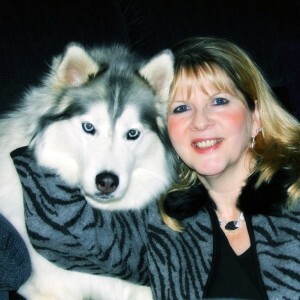 Dorothy Wills-Raftery, co-host of “The Sibe Vibe” on Dog Works Radio, is an author, photojournalist, photographer, editor, publisher, and Siberian Husky parent. She authors the world’s top award-winning Siberian Husky site, the FiveSibes™ blog (http://www.FiveSibes.blogspot.com) and administers the FiveSibes: Siberian Husky K9 News & Reviews community page on Facebook. Her last book is the illustrated children’s tale, What’s Wrong With Gibson? Learning About K-9 Epilepsy and the Live Gib Strong K-9 Epilepsy Awareness Resource Booklet. She is currently working on several book projects, including EPIc Dog Tales: Heartfelt Stories About Amazing Dogs Living & Loving Life With Canine Epilepsy, her second FiveSibes Tale Getting Healthy With Harley, and a holiday rescue story Buddy, the Christmas Husky (all to be published by ArcticHouse Publishing). She is a member of the Dog Writers Association of America and Pet Photographers of America Alliance. She has been a featured pet parent in The American Dog Magazine, and is a contributing writer and photographer for American Pet Magazine, Ruff Drafts, and for the new Furever Rescued Project’s magazine. She is the founder of the “Live Gib Strong” K9 Epilepsy Awareness campaign, and helps to raise funds for Canine Epilepsy Resources “Emma’s Fund.” Recently, House Wolf K-9 Dog Biscuits from Vermont used Gibson as their model to create a new, wholesome treat specially formulated with the Epi-dog in mind, called “Gibbie Snacks,” where $1 from each bag sold will be donated to The Wally Foundation (for Canine Epilepsy). She wholeheartedly supports Siberian Husky rescues, and works closely with several on behind-the-scenes projects. You can follow Dorothy and the FiveSibes on Twitter, Instagram, at FiveSibesMom.